I was a student union activist at University many years ago; involved in committees and things. One late evening, with the Union Council had been discussing a new constitution for many hours, and people wanted to wrap it up and get to the bar before its late licence ran out..
And we came to the last proposed amendment; the chair was taken over by a Steering Committee member, for no amendment could be debated from the chair. And Rob, the chairman had serious views on this one. The new proposed constitution had replaced the word ‘chairman/woman’ with the word ‘chairperson’. Rob rose to his feet; in his hand he held a large stuffed teddy bear. He introduced the bear. This, as he pointed out, was a toy, but some people got attached to their toys and thought of them as real, so let’s call this a person. But now let’s look closer: it’s a teddy bear. It’s an ‘it’. It’s not a male or a female. It’s got something important missing – no, perhaps not what you’re thinking. What’s missing is a major part of its identity, the part that, if it had it, would make it he or she; or even allow it to be uncertain about which. The part that applies to living, thinking, reasoning, being humans. I haven’t got that bit missing, he said. I’m a man, not just a person. My predecessor in the chair of this Union was a woman, not just a person. Mr Acting Chairman, he said, I oppose this change on the grounds that it is a lie and a belittling of humanity. Perhaps because it was late; perhaps the various-tasting smoke drifting over the meeting; perhaps because of the teddy bear, but just perhaps because his words hit a sense of identity in those listening, the word ‘chairperson’ was struck out and replaced by ‘chairman/woman’; the majority for doing so was massive. I have little doubt that now the constitution of that union has a place for a ‘chairperson’, genderless, identity-impaired, inhuman. For that’s what we now expect, and how a society has grown away from valuing people as complete people. It may seem an abstruse point of language, but it’s fundamental. Every time a man or woman is used as a ‘person’, his or her identity is devalued, and part of his or her humanity ground in the dust. A blog seems as good a place as any to record walks; I’ve uploaded this one to Everytrail as well, but there’s always the risk a site like that closes. 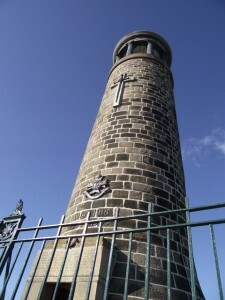 This walk was a shortened version of one we have in a book; in all it’s just over 4 miles, and took us around 2 hours, with plenty of time within that for looking at views and climbing the tower at Crich Stand itself. Puns available: the Cliff Inn, and the Derwent Inn at Whatstandwell (though it was closed today, despite its notices saying otherwise). 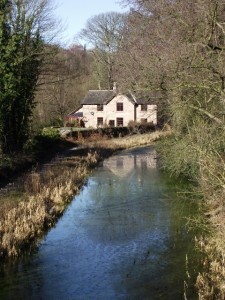 Cross the railway and then the canal using the two linked bridges. Continue along this path to the road. Now turn into the Green and continue along this road as it in turn bends left. At the end of the lane there is a narrow path straight ahead; take it. You emerge onto Top Lane. Turn right, and within about 40 yards turn left at a footpath sign. Follow this footpath upward through woodland, continuing straight ahead as it crosses two larger tracks. Once it emerges onto open land, it soon splits into two – take the right hand fork. Now continue straight ahead along this lane and then across fields – there are one or two bends and diversions. 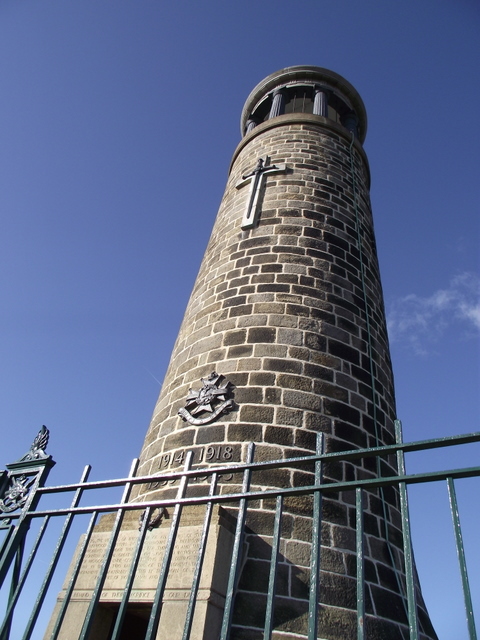 Once at Crich Stand, follow the signed footpath which leads off to the right of the immediate approach to the monument. This path curves continuously leftward round the quarries, and then drops down to cross the end of the tram tracks; then it works its way down through woods until, having become a farm track then a track by some houses, it reaches a road, Leashaw. Turn left, then immediately right onto another footpath. Turn left onto the Cromford Canal, and follow it back to the carpark. We chose Alençon for a stop on the way back from the Vendée to the ferry, arriving in the mid-afternoon on Saturday. 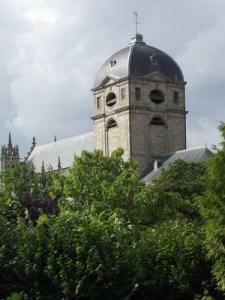 The Basilica of Nôtre Dame, raised to this status by Pope John Paul II in recognition of its role in the life of the family of St Thérèse of Lisieux, is a strange mix of two styles. At one end the Gothic windows form a tracery along the walls of the nave; beyond this the solidity of an 18th century tower and transept (which replaced the former tower, toppled by a storm). The newer end is solid, unbreachable stone, like a fortress; the older exuberant and confident. The mixture somehow leaves a sense of change and uncertainty. We sat outside a bar across the square from the Basilica and drank a beer, while perusing the leaflets provided by the tourist office. The English in the leaflet about the Basilica itself likewise leaves a sense of change and uncertainty; it’s once been translated well, then had extra bits added! Inside the Basilica the side chapel dedicated to St Thérèse and her sense of peace and gentleness lies immediately opposite that of St Jeanne d’Arc, whose image is military and patriotic; two deeply contrasted derivations of the Christian life face each other, each unashamed. The information boards are clear and gently understated. Mass is celebrated at what appears to be a wooden altar in front of the original stone one, as though the practice of the priest facing the people during Mass is still regarded as a temporary phase; the omissions and slight variations in the liturgy perhaps also indicate an uncertainty over the Roman Liturgy itself, and are even more confusing to the visitor already working in a foreign tongue. The congregation is reasonably numerous but aging. The homily focussed on the feeding of the five thousand as a sign of the unity of bread, word and mission. One senses a contrast between the older, quieter people at Mass inside and the noisier and younger life of the square outside; but the clangour of the bells announcing finally that we were dismissed into the world to take Christ out into its carelessness brings the two into unity. If those bells did not ring out the town would not be the same, and one senses that the town knows that. We stayed overnight at the Hotel du Dauphin, St Pierre des Nids, for which an unashamed recommendation. The room, recently redecorated, still perhaps no more than a room, but comfortable and fresh; the food is excellent and the service from the owners, Olivier and Sonia, is welcoming and cheerful. In the morning, we strolled round the village and gained the sense that there is more to do around here then we knew – we will return. Then back to the city to visit the Martin’s House, where the parents of St Thérèse lived, and where the little flower herself was born. A smiling nun with a good grasp of English is called to show us round, and does so with a mixture of history, spirituality and personal joy which is quietly inspiring. The réalisation of the museum is very well done and brings the past alive, preserving something of the life of the family amid the shrine which has grown up alongside it. There is perhaps little of St Thérèse herself here – the house saw only some of her early childhood, though there are glimpses of her life and character – but the daily holiness of the lives of her parents stands out clearly. We’re in France, for a holiday. The autoroute from the channel port takes us to Chartres; a convenient stop on our way to the Vendée coast. Chartres is a delight – the centre of the city with its small streets clustered round the Cathedral; one feels connected with the mediaeval. This is probably enhanced by the city having placed all its major car parks underground; the rush of the modern buried beneath the feet of the ancient. The market in the sunshine is a riot of colours; there is a sense that there is food everywhere, from the market stalls to the dozens of restaurants. The Cathedral may be several centuries old, but the realities of life – the need for physical as well as spiritual sustenance – have not diminished. 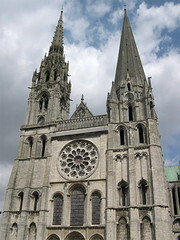 Chartres Cathedral is a jewel; relatively untouched by the attentions of reformers and of wars, it retains a full suite of saints and angels in its carvings; its unmatched towers strive for the heavens. Inside there is more colour, at times rivalling the market; the stained glass in the windows catching the high sun and spreading a pattern of gem-like light across its floors and the ranks of chairs. On its floor is a famous labyrinth, said to have been used by the monks as part of their life of prayer – could they not have used the maze of streets outside? – but no, for they were monks, and aware of the labyrinth of daily life as well as the internal labyrinth of the soul. There is a major programme of cleaning and restoration going on, meaning that part of the interior is clothed in scaffolding and plastic sheeting. Looking up one can see where the clean stone meets the stone still carrying the grime of centuries in an inadvertent parable of purgatory; one day, we too shall be as clean as this, having been as grimy as that. In the cleaned area, the light is more intense, the darkness is seen as an artefact of time. We must return when it is complete (in 2014); to appreciate how this cathedral (and presumably most mediaeval cathedrals) were in fact places of light and air, not the dark and heavy places they now so often seem. We pay our money and climb the bell tower – I have too much respect for man-made heights to venture too near edges, but there is space here to stand a little back. 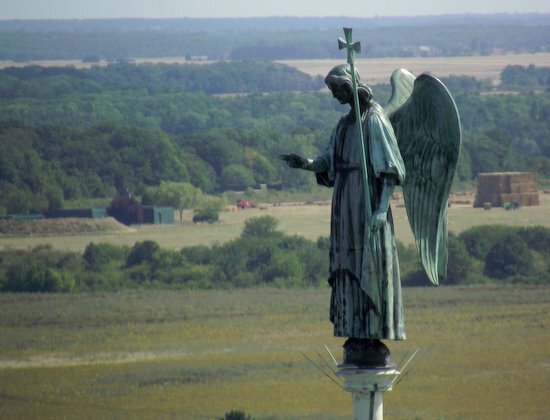 On the roof of the transept a stone angel blesses the town, and from the bell tower stands out against the fields of the countryside, making its own urbi et orbi, as it has for hundreds of years, and will no doubt continue to do for many more.